Home Crepe Blog A Toast to Success & Opportunity! 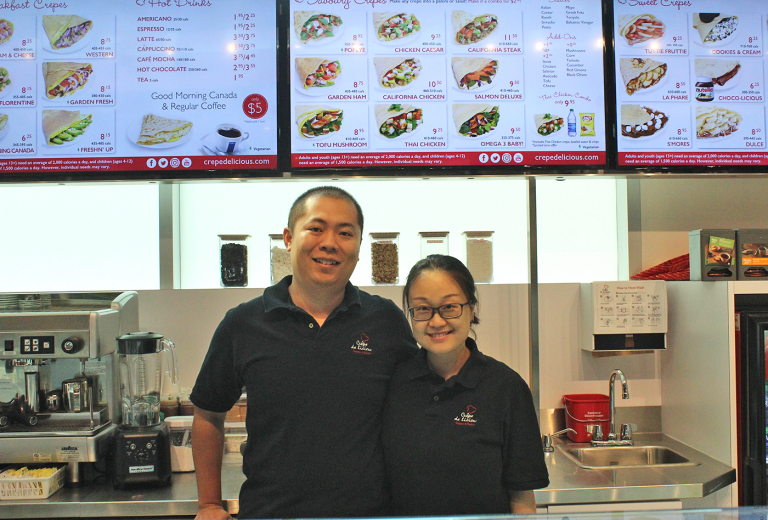 Zhongjin Xue and Li Bao, opened their very first Crepe Delicious location in Edmonton, Alberta on June 16, 2016. Since that time, Zhongjin and Li Bao now own three Albertan locations – two in Edmonton and one in Red Deer. Their commitment and strong passion to fresh ingredients and serving delicious food to satisfy the many hungry bellies, has led them to achieve much success in their journey with Crepe Delicious. Last year, on September 27, 2017, Xue and Bao were awarded Gold for Best Dessert for the 2017 issue of the Golden Fork. The full article can be viewed here: https://issuu.com/blackpress/docs/i20170927070720749. The award for Best Dessert came shortly after the storefront opened in April 2017. We want to recognize and toast Xue & Bao for their sincere commitment to ensuring the happiness of our customers and their continuous contribution to growing Crepe Delicious. The first Crepe Delicious opened in 2004 and our success was immediate. The following year, we were franchised! Currently, Crepe Delicious has over 30 locations in Canada, 15 locations internationally – and we are growing fast. We are expanding into the United States and are looking for partners who share the same passion and commitment with us. We will be at the Franchise Show in New Jersey on Saturday February 17 to Sunday February 18. We’re excited to discuss potential opportunities and can’t wait to meet you!